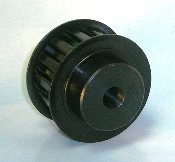 13L050 Steel Timing Pulley MPB Bore = 3/8", 2 Flanges and Hub. Fits L050 belts (3/8" pitch, 1/2" wide). OD=1.522" PD=1.552"